What should investors make of the goods and services tax (GST)? To start with, GST is not an event that should drive investment decisions, and it is only one among many inputs in the process. GST can cause short-term disruptions that may be both positive and negative; but this is noise that is best ignored. The sensible thing to do is to focus on the medium- and long-term, to see if revenue improves and if the organized sector and therefore listed companies see acceleration in growth. Here's a look at what may lie ahead. The government gets credit for sticking to its (revised) deadline of 1 July. GST is a crucial reform that improves its credibility both within and outside the country. Moody's Investors Service was quick to announce that GST was positive for India's rating as gross domestic product growth will improve and tax revenues will increase. That's a pat on the back but stops short of a rating upgrade, and remains at a level that the government is unhappy with. Buy noise filters. Jokes apart, treat all data that you see now with a pinch of salt, as there may be a fair bit of distortion. Consider what happened in June. Many industries, such as cars, packaged consumer goods and pharmaceuticals saw traders and retailers cutting down on stock. They wanted to hold minimum inventory to lower risks post-GST. Some retailers even offered huge discounts to dispose their stock. What does this imply? Listed retailers are likely to report a spurt in sales growth in the June quarter. But that doesn't mean consumer spending is rising or that consumer goods companies have done well. These companies are likely to see a hit on sales in the June quarter. Their dealers were busy clearing inventory and lowered fresh purchases. The so-called destocking means companies' reported sales growth will be lower and may affect profit growth too. As such, the June quarter results will see the first leg of distortion in the sales data. As an example, month-end retail pharmaceutical inventory was down from about 40 days to 17 days as of 28 June, according to market research agency AIOCD Awacs. That means roughly 23 days of lost primary sales for companies. Companies would have cut production in response and in turn reduced their raw material procurement. These actions should eventually reflect in the revenues of intermediate and basic goods' industries too. In short, expect a dip in sales growth in the June quarter for producers, which will vary from sector to sector, and an increase in sales growth for retailers. As mentioned earlier, investors should avoid the noise in this data. After all, the September quarter will see this reverse, as the trade channels get accustomed to post-GST life and rebuild inventory. Similarly, retailers may see slower growth, as discretionary consumption that was advanced to the June quarter will not repeat in the September quarter. That is the main question investors should be asking. Consumers have been shopping in recent weeks to take advantage of the discounts on offer, which is a good sign. Companies have begun to pass on price cuts to consumers, where there are tax savings. That should help demand too. But companies will also hike prices of products where tax is higher, though they may do it gradually and quietly. Consumers also need to get used to GST. Earlier, they never saw the excise component individually but now they do. Some grumbling is already visible on social media but consumer education may allay their apprehension. Investors should get their first formal feedback from management commentary post-June quarter results, especially on demand and the channel inventory situation. Eventually, it boils down to whether demand reverts to pre-GST levels and whether more income is being captured in the indirect tax net. If the net impact of price changes on goods and services is positive for the household budget, then that is a good sign for consumption growth. What about the unorganized sector? 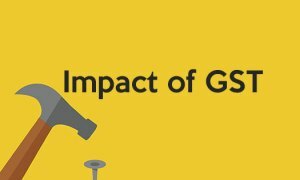 GST poses a big question mark on what happens to the unorganized sector. Wholesalers who cater to rural markets and in tier-II, tier-III markets are not prepared for GST, according to firms. News reports indicate some wholesale markets downing shutters in protest. A Mint report says apparel makers are saying their suppliers and customers are not ready for GST. This may well be a temporary phase, as Indian businessmen can quickly adapt to changing circumstances. If their business model turns unviable by coming into the tax net, their survival may be under threat. The consensus view is that the organized sector will gain over the unorganized, as GST creates a level-playing field. This is a trend that will play out over the years but can be transformational, and is something that investors should be keeping an eye on. The second half of fiscal year 2018 is when the picture will begin to clear but the full impact of GST will, perhaps, become visible only in the next few years.